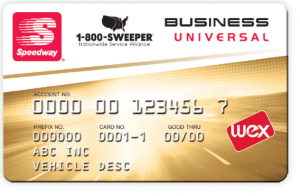 The Speedway Business Fleet Card program, powered by WEX, is a regional fuel program providing both discounts and rebates on fuel purchases for 1-800-SWEEPER Member Partners. Discounted fuel can be purchased at all Speedway, Rich Oil or Gas America locations in a 15- state area. The map below (click to enlarge) shows the locations of Speedway, Rich Oil or Gas America within PA, DE, VA, NC, SC, GA, FL, TN, KY, OH, IN, MI, and IL. To find out more or start taking advantage of this program, please call Andy Williams at 419‑276‑6665. Price is Cost Plus $0.09/gallon or Retail Minus $0.03/gallon, again, only at Speedway locations. $0.01/gallon for all fuel purchased at Speedway locations. 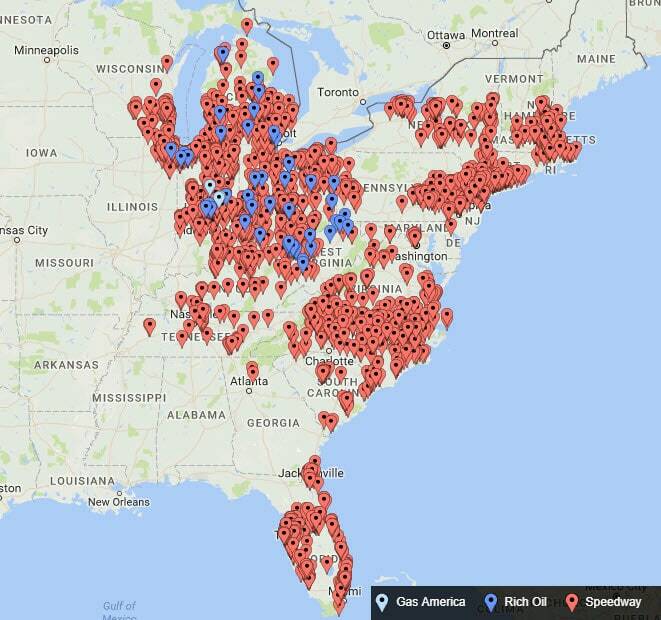 Locations of Speedway, Rich Oil or Gas America within PA, DE, VA, NC, SC, GA, FL, TN, KY, OH, IN, MI, and IL.